Antivirus Best is a fake security software (rogue). It displays fake alerts to justify an infection to incite users into buying a license. As always, detection of fake infections to scare users and a promise to remove all infected files/keys when activated for $49,95 (1 year license). MalwareCatcher, VirusShield, Extra Antivirus, Virus Sweeper, Ultra Antivir 2009, Virusdoctor, VirusMelt, VirusAlarm. MalwareDestructor comes from fake online scanners and detects nonexistent malwares to scare users. VirusShield rogue comes from fake online scanners. Usually, those fake scanners have Windows (XP/Vista) style. This new one have a DOS design, in a browser page... with a STOP BSOD imitation alert. Advanced Virus Remover Rogue displays fake infections to incite users into buying a license. - It is hosted on an IP block known for criminal activity. 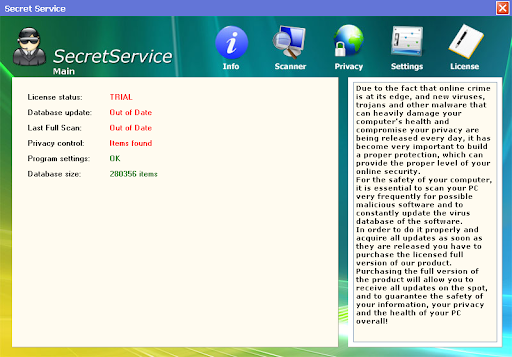 - HijackThis program was bundle without Trendsecure permission. - Users had to buy a license to activate cleaning option. This should not be a problem if we ignore the fact of giving personal informations from an infected system to register. But important rogues components remains active after cleaning process when Loaris removal guide claims to remove those rogues and argues it "was created especially for such types of rouge programs". Loaris Trojan Remover never acts like classic rogues. - It is NOT promoted via Trojan or fake online scanners. Considering that creators have quickly removed HijackThis from their tool and think about moving to another provider that does not have illegal activities. Considering that the tool has now 15 days trial, users don't have to buy a license and can test efficiency of it. (web pages saying it can remove malware it was not able to have been removed). Considering the creator's reactivity to fix those problems, Loaris Trojan Remover have been declassified from Rogues application. VSCodecPro is the new version of PCCodecPack, LuxeCodecXP, WinCoDecPRO. It display fake alerts about media problems. When trying to run Windows Media Player, it displays an alertbox and redirect to vs-vodec-pro.com webpages. Analysis of a Malware trojan downloader on MAD blog (French). Update: Loaris Trojan Remover have been declassified from Rogue applications: Link. Loaris Trojan Remover is a rogue anti-spyware program. The tool has a dirty malware database. It can detects some real infections on a system but is not able to remove the full infection when registered. It is bundle with HijackThis tool. Loaris Removal Guide says it can get rid of UnVirex rogue. 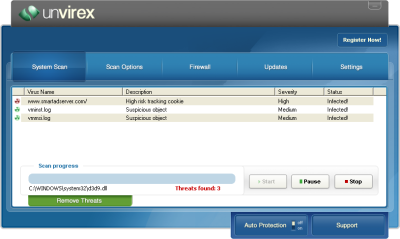 After cleaning, some UnVirex componant (LSP Hijack) are still active. 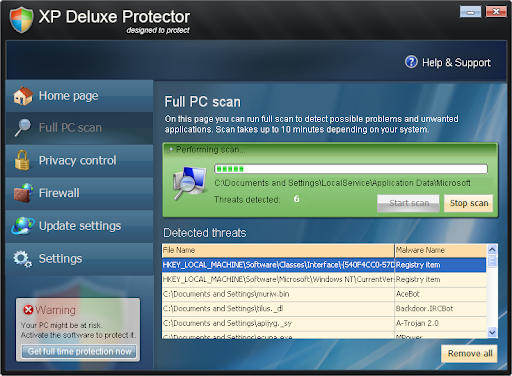 XPDeluxeProtector is a new fake security software from the same creators of Win PC Antivirus, Win PC Defender, XP Police Antivirus, IE-Security, WinDefender 2009 and Total Secure 2009. Antivirus System Pro Rogue is a clone of Spyware Protect 2009. Digiweb corp. (aka ibisweb corp , G. Kavalakis) makes fake security softwares. They detect nonexistent problems (Spyware, Registry, IE Cache, Cookies,...) to scare users. Some of their products have the old interface, some others have the new one. UnVirex is a new fake malware cleaner (rogue).